Teaching of geographical disciplines in MSPU began in 1906, and in 1934 the geographical faculty appeared. In different years the famous geographers and teachers worked at faculty: V.I.Vernadsky, D. N. Anuchin, N.N. Baransky, S. V. Bernstein-Kogan, A.A.Rybnikov, A.S.Barkov, V.A.Varsonofyev, I.S.Zvavich, A.A.Kruber, A.A.Polovinkin, Y.G. Saushkin, N. P. Nikitin, V. G. Erdeli, M. G. Solovyev, K.V.Pashkang, T.V.Vlasova, V. V. Dobrovolsky, Rodzevich N. N. and others. There are 5 departments in the faculty structure: geology and geochemistry of a landscape, physical geography and geoecology, economic and social geography, technique of teaching of geography, foreign languages of the second specialty. More than 70 % of teachers of faculty have scientific degrees of candidates and doctors of sciences. Among them the well-known scientists heading scientific schools, the authors of school and univercity standards of education on geography, programmes, textbooks and manuals: the head of the department of economic and social geography, the academician of Russian Academy of Education, the winner of the State awards and Awards of the President and the Government of the Russian Federation in the field of education, the doctor of geographical sciences, the professor of V.P.Maksakovsky; Honourable worker of higher education of the Russian Federation, doctor of geographical sciences, corresponding member of Russian Academy of Education, professor of V.P.Dronov; doctor of pedagogical sciences, professor A.A.Lobzhanidze; the head of the department of a methods of teaching of geography, candidate of pedagogical sciences, professor of I.V. Tushino; candidate of geographical sciences, professor E.M.Rakovsky; doctor of geographical sciences, assistant professor A.V.Chernov; head of the department of foreign languages of the second specialty, aossciate professor E.N.Shklyarevskaya. In accordance with Federal State Education Standard faculty implement the following educational programmes. Training Modules — «General Geography», «Cartography», «Physical Geography», «Socio-economic geography», «Ecology». 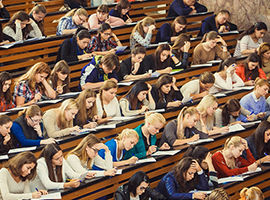 Elective courses: «Geography of Culture»/»Ethnogeography», «World Economy»/»Russian Economy», «The physical and geographical area studies», «Economic and geographic area studies», «Local History», «Tourist-excursion activity», «Psychological and educational technology», «Modern educational technology in geography». 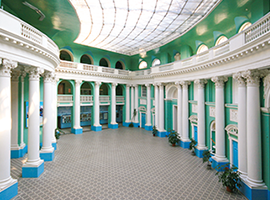 Teaching practice is taken place in Moscow suburban areas, Tarusa, Russian regions, CIS and foreign countries. On completion of training graduate can work in the fields of education, cultures, ecology and the social sphere, to continue training in master studies. Elective courses: «Ecology geosystems»/»Ecology technogenesis», «The physical and geographical area studies»/»Economic and geographic area studies», «Psycho-educational technology»/«Modern Educational Technology in Geography», «Applied Biology», «Modern educational technology in biology», «Landscape Design», «Ornamental horticulture». On completion of training graduate can work in the field of education, culture, environment and social services, to continue training in master studies. Elective courses: «Ecology geosystems»/«Ecology technogenesis», «The physical and geographical area studies»/«Economic and geographic area studies», «Psycho-educational technology»/«Modern Educational Technology in Geography», «Historical and cultural aspects of linguistics»/«Social and cultural aspects of a foreign language», «System-functional aspects of language»/«Actual problems of modern linguistics», «Functional styles of speech»/«Applied aspects of speech activity». Internships — Britain, France. Germany and the USA. Courses on choice — «Palaeogeography»/«Evolution of the Biosphere», «Medical geography»/«Recreational geography», «Special Economic Zones»/«The world’s financial centers,» etc. Teaching practice are taken place in Moscow suburban areas, Tarusa, Russian regions, CIS and foreign countries. Practical training — research centers, institutes of RAS. On completion of training graduate can work in the field of geography, economics, management, ecology, education, culture and social services, to continue training in master studies. Elective courses — «The system of European security» / «Europe in NATO,» «Migratory processes in Europe» / «Problems of consolidation modern European nations,» «trans-European» / «World Port of European countries», etc. Teaching practice is taken place the regions of Russia, CIS countries and worldwide. Practical training — research centers, institutes of RAS, public organizations. On completion of training graduate can work in the field of economics, management, science, culture and the social sphere, to continue training in master studies. 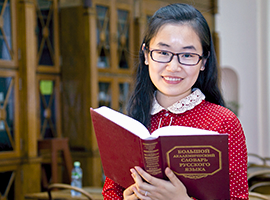 Academic subjects — «Basics of tourism», «cultural center of the world», «tourism regional studies», «Excursion practicum,» «Foreign Language (second)», «Management in the Tourism Industry», «Psychology of business communication,» etc. Practical training — business tourism industry. On completion of training graduate can work in tourism, cultural and social, to continue training in master studies. After the end of bachelor degree the graduates can continue their education in master studies in the direction «Teacher Education», the programme «Technology of geographical education». «Theoretical and applied landscape research» — development of theory and methods of applied landscape studies. The dissertational council accepting the defending of doctoral and master’s theses by specialties works at the faculty: economic, social and political geography, physical geography and biogeography, geography of soils and landscape geochemistry. A foreign language (English, French, German, Spanish) — 1200 hours (six semesters). The translator in the sphere of professional communication (English) – 1500 hours (six semesters). At the faculty traditional students’ events are annually held: dedication of first-year students in students — «Let’s get acquainted!», «The last call», evenings of a meeting with graduates, evenings of bard and marching songs, New Year’s evenings, festivals in English and French languages. For students and teachers various excursions are organized.